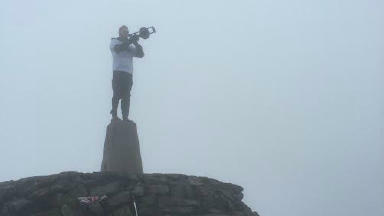 The Inverclyde band hiked up Ben Nevis with a tuba, trombone, cornet, trumpet and flugelhorn. 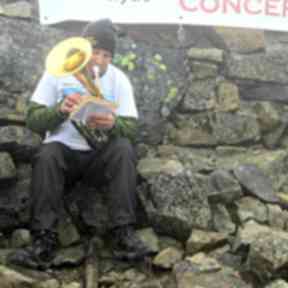 A brass band from Greenock has successfully performed a concert on Britain's highest mountain Ben Nevis. 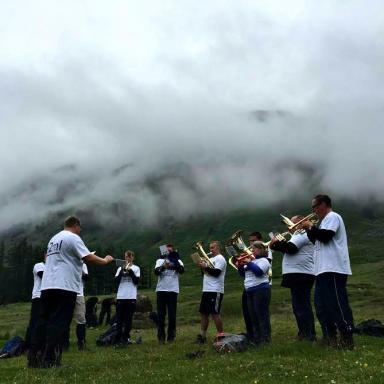 Brass Sounds Inverclyde fought through high winds, soaking rain and even snow underfoot to hike up Scotland's most famous mountain with instruments strapped to their backs, including a heavy tuba and fully functioning trombone. The intrepid musicians reached the summit in time to put on an afternoon recital to raise vital sponsorship for the band to attend the National British Band Championships in September. "We had a mad idea that it might be a good way to raise funds for the trip," says John Sutherland, a cornet player in the band. "Ben Nevis seemed like an obvious choice." John, who has suffered several strokes in recent years, joined nine other members of the band for the challenge on Saturday, which took around nine hours to complete. Although not all the members were able to reach the peak, enough of the group were able to climb their way through the mist and icy temperatures of the summit to complete their mission. The band, which included a teacher, biomedical scientist and former nurse, went on to perform a rousing rendition of Amazing Grace and Auld Lang Syne for an enthusiastic crowd of climbers. "I just turned a corner and suddenly heard these trumpets sounding," says Josie Reynolds, who watched the performance. "You just don't expect a flugelhorn that high up a mountain." Standing at 1,345m, Ben Nevis is officially Britain's highest mountain with an annual average temperature at the summit of -0.5C. This is not the first time that large musical instruments have made an appearance at its famous peak. In 2006, a group of mystified mountain volunteers found the remains of a piano in a cairn near the summit which later turned out to be the result of a charity challenge. Nearly 35 years later, Scots woodcutter Kenny Campbell had carted it up the mountain over the space of four days, before going on to play a patriotic rendition of Scotland the Brave for a dancing group of Norwegian climbers. In the case of Brass Sounds Inverclyde, however, every instrument that went up the mountain came safely back down it, along with its weary performer. The band now hope to continue to raise funds for their championship trip later in the year and say they hope to do Scotland proud. "Those who are involved in brass band circles know that winning a British/regional brass band contest is a rarity, often a once-in-a-lifetime experience for many brass musicians," the band state on their mission page. "Being invited to Cheltenham to participate in the nationals is a real privilege, and we are determined to go there and do our utmost."